WILLIAMSTOWN, Mass. -- Neighbors got a big turnout Dec. 16 when Williams College is holding two public briefings about concepts for possible construction of a new art museum. The college said Friday there is no design, proposal or site picked out yet, but various documents and postings have pegged the cost of the proposed facility at $65 million, that it would be 102,000 square feet and would, from a program point of view only at this point, be ideally located at the corner of Main and Southworth streets. Thomas Krens, former director of the current Williams College Museum of Art, disclosed last week that architect Steven Holl had been selected to design the museum and that construction would begin in 2017. However, a college spokesperson, Mary Dettloff, told this blog that Steven Holl Associates "was hired to do a space-utilization and program study only, and not a design." She added: "We have no design." The college facilities committee has looked at a half-dozen sites and liked Southworth the best, Dettloff told iBerkshires in a report posted Dec. 1. She said traffic, parking, geology and cost studies remain to be done and will take months and the project has not yet received trustee approval. Some documents circulated about the proposal have included drawings of a 50-car parking lot. Dettoff said there is no firm plan yet for parking and other considerations, including traffic, geology and cost. These would factor into any proposal which might ultimately be made for a Main/Southworth site, if one is made, she said. The mentioned site is the subject of an iPetitions campaign signed by more than 300 people, many of them Williams faculty and staff, expressing concerns about the Southworth site. Various posts on the iPetition website assert that other locations have been considered and rejected, including the site of the current Williams Inn, the First Congregational Church and the Williamstown Savings Bank. "There is no site picked out . . . I can't comment on all the rumors on the iPetition site," said Dettloff. "I would say 90 percent are rumors . . . we don't have a building schedule for a building being built in 2017 . . . there was a very early conceptual drawing, but it was immediately rejected by the building committee as being too big. We still don't have a replacement concept for that. There is no concept." One site not included in deliberations to date, apparently, is the former town garage site on Water Street, a vacant dirt parking lot that abuts the college’s main studio-art building. The name of the architect selected to design the facility, Steven Holl, was provided last week at a public meeting by Krens, MassMoCA originator and former head of the Guggenheim museums. Krens also said that construction would begin in 2017. Coll’s philosophy yields designs that appear cubist and stark. WCMA is known to be working on a name change, which has given rise to speculation that the college may have secured a major gift for the museum expansion. However, Dettloff said "since we have no design, we have not begun fundraising for a new museum." Some documents in circulation have shown drawings of a four-story museum structure at the Southworth site. Holl has designed dozens of international works, one of which is an eight-building, Linked Hybrid, a 220,000-square foot mixed used complex in Beijing, China, which includes soaring, multiuse, skybridges similar to what could be used to link his four-story design to the Spencer Studio Art Building and to Spring Street if it were built on the town garage site. The idea of skybridges at the town garage cite to create connection between the college, Spring and Water streets was first suggested years ago by former Town Manager Peter Folin. 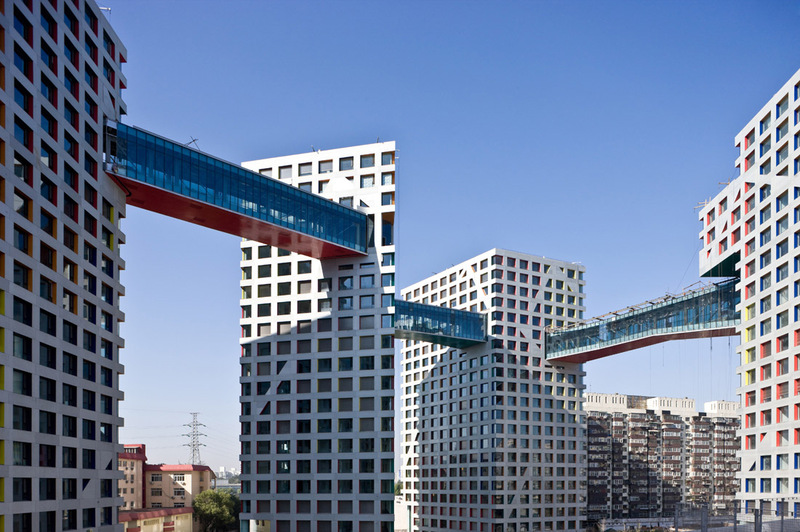 There are pictures on the web of Holl-designed skybridges in Copenhagen and Beijing. The New York-based architect’s other commissions include an addition to the Kennedy Center in Washington, D.C., and a new art museum at Princeton University, both under construction. Anonymous comment on the unofficial "EphBlog"
Former Massachusetts governors Michael S. Dukakis and William Weld, joined former Guggenheim museum director and MassMoCA originator Thomas Krens on Sat., Dec. 5, 2015 to describe plans for an "Extreme Railroad and Architecture Museum" and a new "Global Contemporary Collection and Museum" near the Harriman & West Airport, both in North Adams, Mass. The event was well covered by several news organizations, including The New York Times, Art News, iBerkshires and The Berkshire Eagle. To watch video or hear audio of the key 27-minutes of the presentation, including remarks by Dukakis, Weld as well as Krens' description of both projects, with slides, click on the links below.